Mildred Mabel Clark, daughter of John Clark and Cammie Webster. Last week, the little daughter of Mr. and Mrs. John Clark was buried at Macedonia, Rev. G. Gayton preaching the funeral. Her death certificate states that her parents are John Clark and Cammie Webster. 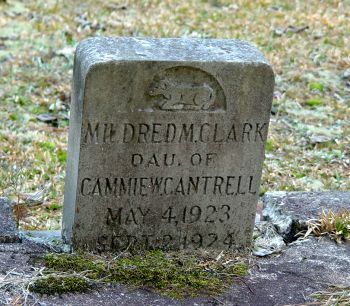 Mildred’s tombstone states: Mildred M. Clark, daughter of Cammie Cantrell. Cammie is buried next to William Cantrell at Oak Grove Cemetery in Cherokee County. There is a daughter buried there who is listed on her tombstone as G. Bernice Clark, daughter of Cammie Cantrell.